This popular add-in has undergone many revisions. Please keep an eye on the What's New page for new releases. To avoid preparing a complete set of new illustrations to cover minor changes in presentation, some of the illustrations shown will be from earlier versions. 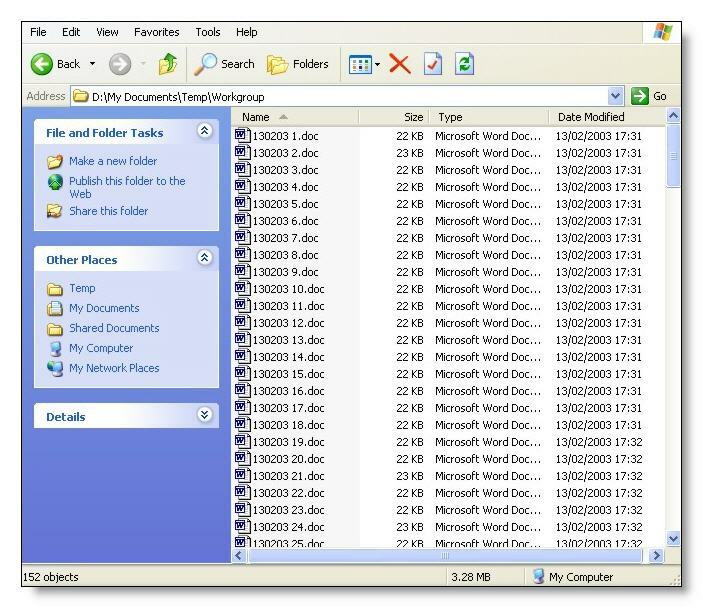 The add-in is provided in two versions: a dot format template intended to work with Word from version 2002 and 2003, and an XML format (dotm) template for Word versions 2007 and later. The 2007 and later version includes a few additional features, but otherwise the two versions are essentially similar. The 2007 and later version should also compatible with the 64 bit versions of Word. Users have reported issues with CSV files, when using this add-in, and the recommendation is to use an Excel data source where possible. But with a field count of over 256, this is not practical and so for the benefit of such users (and others who might like an alternative approach), I have prepared a companion add-in - Merge and Split - which has its own web page. It is possible that some third party add-ins may interfere with the operation of this add-in. If, for example, you experience a 4198 error, check that you don't have present an add-in 'ScanSoftPDF.dot' installed by Scansoft PDF Convertor Professional, which has been reported to conflict. There are download links before the macros listings and at the end of the page, but please read the instructions first. For earlier Word versions (97 & 2000) the macros included later on this page should provide an alternative means of splitting merge documents. Extract the relevant template from the zip file to the Word startup folder, which by default can be found (in English language versions of Windows) by typing %appdata%\Microsoft\Word\STARTUP in the address bar of your Windows Explorer application or browser. If you don't have write access to this folder, ask your IT support to install it for you. Extract ONLY the required template. If updating from an earlier version of the add-in, remove the older version before starting Word! The self extracting version of the add-in will do this automatically. It has been reported that while Word can handle a variety of merge data sources, CSV format files can be problematic for this add-in. If you are using such a data source, and find that only the first record is created as a document, converting the CSV file to Excel could be beneficial. If you experience a problem with the add-in, do ensure that you have the latest version before reporting the problem, and have read this page to ensure that you are using it optimally. The add-in is under regular development. DO NOT use the add-in template as a document template for creating merge documents! The add-in is designed to save a letter merge document to separate document files for each record. It does this by creating a new document for each record. It has been reported that with the previous version there may be a conflict if you have installed MathType by Design Science. If that still proves to be the case, temporarily disabling MathType should enable the add-in to be used. Error Number 5640: If when attempting the merge, you find that a document for only the first record is created and the process crashes with an error number 5640, the reason is almost certainly that you are using DDE to connect the merge document to the data to preserve Excel formatting. Alternatively use https://www.gmayor.com/MergeAndSplit.htm which employs a different process to split the documents, that is more tolerant of DDE. Command buttons are added to the Mailings tab on the ribbon of Word 2007 and later and to a custom toolbar in Word 2003. 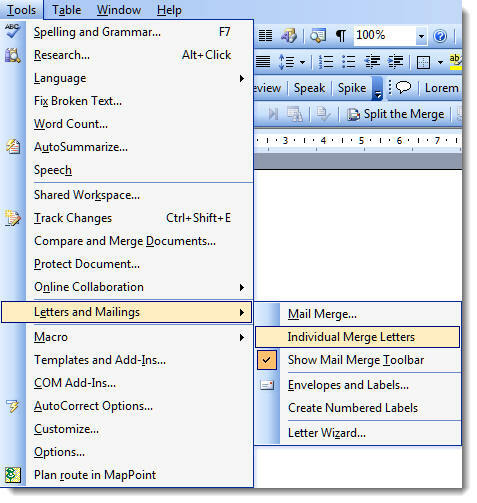 In Word 2003 the main command is also added to the Mail Merge toolbar and to the Tools menu. When updating with the latest version of this add-in, ensure that you reset the registry settings from the toolbar (see below) to ensure there are no conflicting values between versions. When run, the macro checks for fatal errors and will produce self explanatory messages, should such an error be apparent. 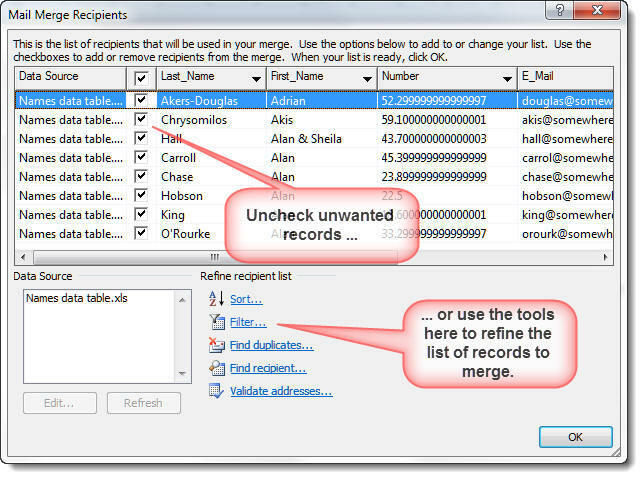 The first dialog is the option to select which records you wish to merge. The add-in version offers the user the choice to save the split files in one from a variety of formats. If the filename field contains the path to the folder in which you wish the files to be saved, check the checkbox. If not, enter the path in the dialog box where indicated. Where the field contains the path(s) and any defined path does not exist, it will be created. This option is not currently available for Sharepoint addresses. An invalid Sharepoint address will cause the process to fail. If your data contains line breaks within one or more cells, then frankly this should be avoided. Prior to version 3.4 one or two users reported had occasionally thrown a 5487 error warning. I knew it was related to file naming, but have never been able to repeat it until a user with this problem sent me a data file to check against a merge document. It immediately crashed with the 5487 error. I established that the problem related to a line break in a field used for file naming. Clearly you cannot have line breaks in file names. Having established the problem, handling it proved far from simple, so I ended up re-writing the whole of the file naming section of the add-in. The Word 2007 and later version provides an additional option to save the merged documents to a Sharepoint location. If that option is checked, the browse button is not displayed and the label wording above the check box changes. Users may now type or paste a Sharepoint path into the dialog. The main form has a tabbed section which provides the additional option to add fixed text to the filenames, either as a prefix or as a suffix (before the filename extension obviously). This text and the location are remembered by the application, so remember to clear them if merging a different document that does not require them. Where such text is used it must obey file naming conventions. Illegal filename characters will be replaced with the underscore character. In have responded to popular request by allowing a second field to be included in the filename. This second field can be placed before or after the initially selected filename field and can be used in conjunction with the text string from the previous illustration, which can also be placed before or after the combined name fields. As the field information is retained between uses of the add-in, I have added an empty 'field name' to allow the second field to be eliminated from the filename. To omit text strings from the filename, simply delete the content of the test string field. Where no second field/text string is selected, the option buttons associated with it perform no function. No doubt someone will now come up with a suggestion to allow more than two fields or more than one text string. If you have so complex a requirement, use the ability to name the file from a derived field in the data source. Thus just about any legitimate filename structure can be achieved. From version 2.8 for Word versions 2007 and later, the add-in offers the option to run a macro on the separate documents before they are saved. This could, for example, be used to re-apply text formatting that had been applied to the data, but which would have been lost in the merge. In order to ensure that macros applied to this process actually run on the document they must pass a document parameter to the macro e.g. Sub MacroName(oDoc as Document). The variable name itself does not matter. In the following code example, a ® characters are formatted with the Segoe UI font and are superscripted. (The sample document includes such characters so that you may evaluate the results). If the Sharepoint folder option is selected, the Sharepoint path MUST be entered (preferably pasted to avoid mistakes) into the dialog. 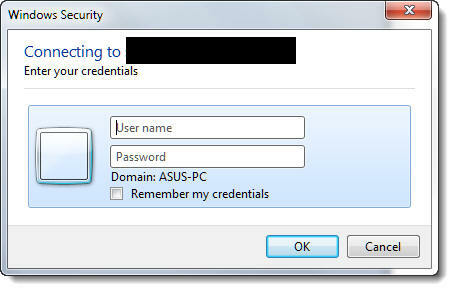 The user will be prompted for the Sharepoint User Name and Password. If these are entered incorrectly, or unknown, the application will crash with an error message no 4198. You may also select the folder to store the merged documents by clicking the 'Browse' button, which offers the standard Windows Explorer dialog. The browse button is not available for Sharepoint folder selection. The add-in creates a series of new documents. It works best if these new documents are created using the template from which the merge document was created. If that template is not available, the new documents are created using the normal template. You can, if you prefer, use the normal template to create the documents, by un-checking the check box shown checked in the illustration above, or run the separate macro from the toolbar, as detailed earlier on this page, to create a version of the document c/w attached matching template. Earlier versions of the add-in would prompt for missing filenames. This has proved a nightmare to code with the changes I wanted to effect, and was also rather irritating in its previous guise, where several records may have had illegal or missing filenames, so I have simplified the function. Now when the filename field is empty or there is an illegal character in the field (see list below), a dummy filename name is substituted. This name is in the format - "NoName Record Number", where Number is the number of the merged record. Where fieldnames have duplicated content, the fieldname of the first matching record is named in the format "Filename" whereas the subsequent matching records have an incremented number appended e,g, "Filename(1)", "Filename(2)" etc. The macro will also reject the name if the first character is a period (full stop). The Word add-in described above also provides the option to create PDF files. With the Word 2003 version, PDF file creation requires the availability of the Adobe PDF driver from Adobe Acrobat or PDFCreator to be installed.. In early versions of Word 2007 the PDF plug-in was an optional extra. The add-in will only offer the Office 2007 PDF plug-in, Adobe PDF driver and PDFCreator 2 driver if they are available. The optional PDF plug-in will be available if Word 2007 is updated to SP2 as this removed the plug-in option and made it part of the application. In Word 2010 and later, the PDF plug-in should always be available, and the functions to use Adobe Acrobat or PDFCreator as alternatives, if present, are retained. The macro detects whether the plug-in is installed by looking for EXP_PDF.DLL file in the folder %programfiles%\Common Files\Microsoft Shared\OFFICE14 (where 14 is the Office version), which is the active part of the plug in. 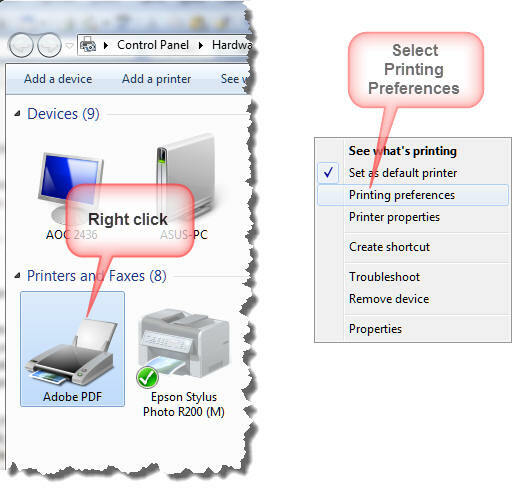 If it is not installed, the add-in then checks whether the Acrobat printer driver Adobe PDF is installed, and if available will print to that. If neither is available a warning message is presented and the merge is made only to the choice of document format. The Acrobat versions compatible with Word 2007 and later provide their own merge function which has greater functionality than is available from the Adobe PDF 'printer' driver or the Microsoft Office Plug-in, though not the ability to name the PDF files from the data source. If you have Acrobat installed, investigate this if you need to merge to PDF. The Acrobat add-in also offers the option to merge PDF to e-mail attachments which the individual merge letters add-in does not include. However see also my Many to One add-in which does provide this functionality. Uncheck the "View Adobe PDF results" and "Prompt for Adobe PDF filename" items. The illustration above is from Acrobat 10 (earlier versions of Acrobat have similar options). Select the field in the datasource that will supply the filenames and check the box 'Do you want to create PDF files' in the dialog box shown below. In response to popular request, I have also included an option to create the PDF files using the Open Source PDFCreator. Where the PDFCreator driver is present, the PDFCreator button shown in the illustration above will be enabled. The process has been configured to use the current version of PDFCreator and it will no longer work with the earlier version 1.7.3. and attempting to do so may cause the process to crash. Note that this also includes PDF Architect, which is not required, and unless you want this application, I would recommend that you use the 'Expert' installation settings and uncheck PDF Architect. Note also that the installer will offer assorted plug-ins for your browser, that are certainly not required. Make sure you de-select these during the installation. 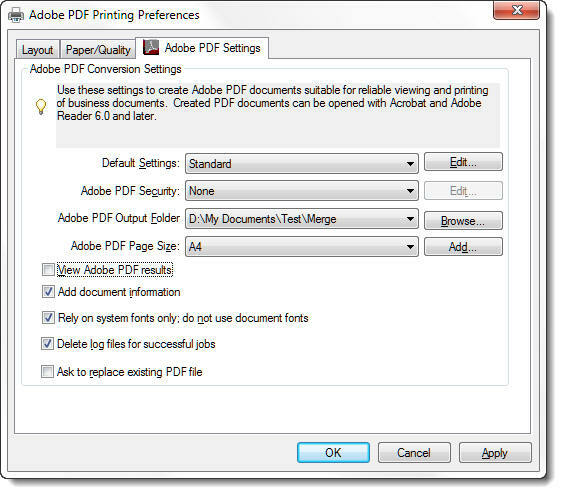 When merging to PDF format with PDFCreator the add-in additionally provides the option to engage PDF security measures. When the 'Continue' button on the main dialog is clicked, a second userform will open to offer that facility. Clicking 'Cancel' on this userform will cancel the whole process. Currently the additional security options are only supported when the option PDF is checked. Should you check one of the other PDF format types, the dialog changes as shown below and any security settings entered are returned to their default values. The items shown disabled in the illustration above become available when a Master Password is entered. If you don't want additional security measures then don't set a Master Password! If you enter a Master Password and continue without setting options, you will see the following dialog. Click 'No' to set options or 'Yes' to continue without. The PDF files are created in the same folder as the documents. It has been observed that the processing demands of very complex merge documents, can result in problems, even to the extent of the add-in crashing Word completely. In such cases, and provided the data source is an Excel worksheet that meets the standards required by the add-in, you could try the Many to One add-in. This add-in does not use mail merge, but processes each record as a separate task. The final result can however be much the same. There is a note on the Many to One page that explains how to use it for this task. Print individual merge letters from a merged document - doing it the old way. If you create a merge letter and merge to a new document without using the add-in to split the merge, you get one long document with each of the individual 'letters' separated by a section break. Split the single merged document into separate letters. Having merged to a single document, it is still possible to split to separate documents, with the use of a macro. To this end Doug Robbins also came up with the following, to which I have taken the liberty of making a couple of small changes. The macro splits the document and files each sub document into the indicated path. The files are named by date and sequence number, with the date format from the mask. Both these variables can easily be changed to reflect personal preferences - nor should it be too difficult for those with vba programming skills and inclination to modify the code to prompt for a name and/or path.
' mailmerge as a separate file. & " " & LTrim$(Str$(Counter)) & ".doc"
'To use an alternative template follow the link. MyText = "Enter a filename. Long filenames may be used." This is easier said than done as, once the document is merged, the data file no longer forms part of the merge letters. There are a couple of approaches that may be considered, but the one I favour requires the field to be used as the filenames to be added to the top of the merge letter on a line of its own. When merged, the fieldnames will be those first lines of the merged letters. The macro then removes the lines to restore each merge letter to its required format during the splitting process. The only proviso when choosing filename fields is to choose a combination that will produce a unique result. If duplicate filenames occur, the macro as written will simply overwrite the saved file with the new file of the same name. The filename fields above are inserted in red for clarity - the colour applied does not affect the result. Following the merge (below), the fields are translated into a 'filename'. When the macro is run, the filename fields are stripped out leaving the merge letters.
' the top of the merge letter - see web article. Docname = "D:\My Documents\Test\Merge\" & sName & ".doc"
Where a merged document consists of several elements e.g. the first page of each merged letter should be printed on letter headed paper from a different printer tray, or the printer provides a stapling function for each 'letter', a frequently encountered problem is that the printer loses track of the tray assignments or in the case of the stapled document, the whole merge is treated as a single document. To overcome this problem, fellow MVP Doug Robbins, came up with a macro that treats each letter as a separate print task. To use this macro, merge to a new document then use the macro to print that document. IMPORTANT!! Several of the macros featured on this page create their new split documents by using the default Normal template as a basis for the documents. If the merge source document has been created from a different template, with different margins or page size, the resulting split documents are not going to match the layout of the merge document. To overcome this issue, you could create an empty template, by deleting the content of the merge source document and save it as a template, then base the split documents on that template. The add-in includes a function to create a template from the document upon which the following macro is based. The following macro will create a template from the merged document called splitmerge.dot(x) which it will store in the default user template location. Microsoft does not include a function to merge documents to separate files. The add-in featured on this page overcomes that limitation. This add-in was inspired by a number of macros produced by fellow Word MVP Doug Robbins, which appear in modified form at the end of this page.